Perform "Inspection After Repairs" after replacing the cylinder head sub-assembly or cylinder head LH (See page ). To prevent contamination by foreign matter, install immediately after applying adhesive. (a) Apply adhesive to the No. 1 straight screw plug of the cylinder head. (b) Using a 10 mm hexagon wrench, install 4 new gaskets and the 4 No. 1 straight screw plugs. (a) Using a 14 mm hexagon wrench, install 2 new gaskets and the 2 No. 2 straight screw plugs. (a) Using a 10 mm hexagon wrench, install 8 new gaskets and the 8 No. 3 straight screw plugs. 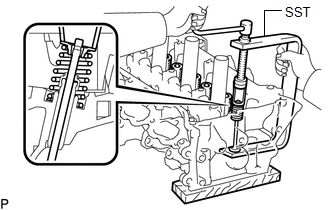 (a) Apply adhesive to the union of the cylinder head. 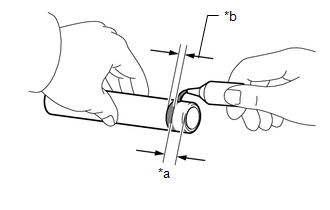 (b) Using a union nut wrench (12 mm), install the union to the cylinder head as shown in the illustration. If the stud bolt is deformed or the threads are damaged, replace it. 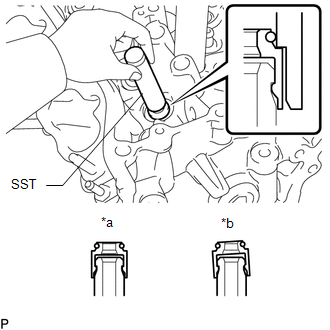 (a) Using E6 and E8 "TORX" socket wrenches, install the stud bolts. (a) Apply a light coat of engine oil to new valve stem oil seals. Pay attention when installing the intake and exhaust valve stem oil seals. For example, installing the intake valve stem oil seal to the exhaust side or installing the exhaust valve stem oil seal to the intake side can cause installation problems later. The intake valve oil seals are black and the exhaust valve oil seals are gray. 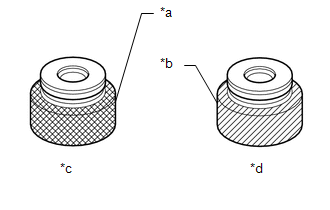 (b) Using SST, push in the oil seals. 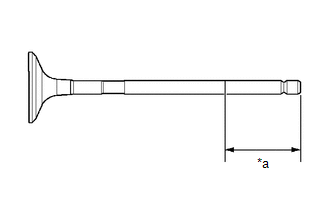 (a) Apply a sufficient coat of engine oil to the tip area of the exhaust valve shown in the illustration. 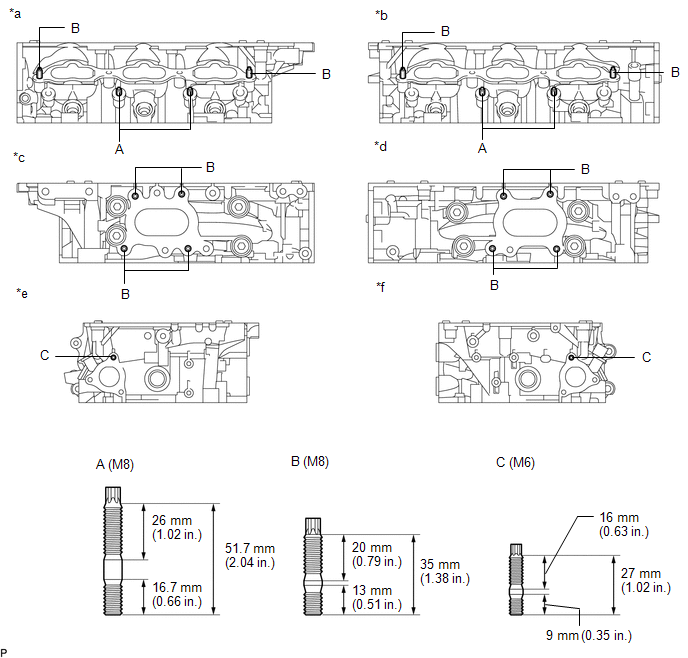 (b) Install the exhaust valve, inner compression spring and valve spring retainer to the cylinder head. 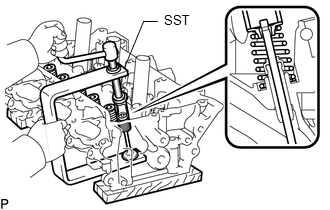 (c) Using SST, compress the inner compression spring and install the 2 valve spring retainer locks. 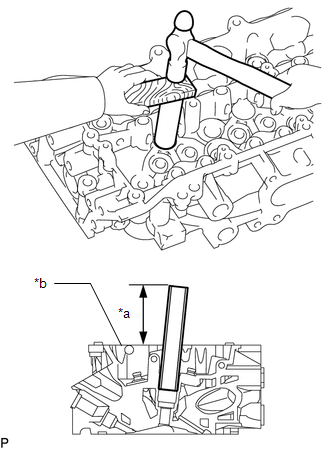 (a) Apply a sufficient coat of engine oil to the tip area of the intake valve shown in the illustration. (b) Install the intake valve, inner compression spring and valve spring retainer to the cylinder head.